Having our hands in concrete for generations has taught the Kobush family a thing or two about concrete. We’ve seen it and repaired it all – from our beginning working with Kansas City homeowners to bringing new concrete repair technology to the most iconic business and institutions in the area, such as Kansas City International Airport, KC Streetcar, Children’s Mercy Hospital, the Kansas City Royals, Casey’s General Stores, the Kansas City Zoo, JE Dunn, Zona Rosa, the Legends and more. When it comes to concrete failures in commercial and industrial applications, tearing out and replacing concrete is a messy, invasive and costly option. Plus it requires a lot of equipment and cure time, not to mention inconveniences customers and disrupts business. By fast, we mean hours not days. By economical, we mean often times at less than 50 percent the cost of replacement. CCS’s concrete surface repair is low-impact, cost-effective solutions that get you back to work in as little as 10 minutes after the repair. Our innovative and proven repair methods and materials stand up to the abuse that commercial and industrial concrete is exposed to from forklift drivers, truck drivers, weather, water, humans and more. Those aren’t just words, they’re our guarantees. Low impact service: most repairs completed and back to service in less than one hour. Customer convenience: we keep your business moving, not shut down. Guaranteed- ROI: repairs cost dramatically less than traditional tear out and replace. Guaranteed- products: CCS only uses proven innovative products field tested for years of service. We strive to deliver the best solutions for our customers. From working overnight to repairing in cold weather, we have high standards for meeting our customers needs. We also have high standards for ourselves and our product. We participate in state and national level concrete institutes and trade associations that help us stay ahead of the latest technology and concrete standards. Knowing our products and processes are the best in the industry is why we guarantee our work for one year - the same as concrete replacement. 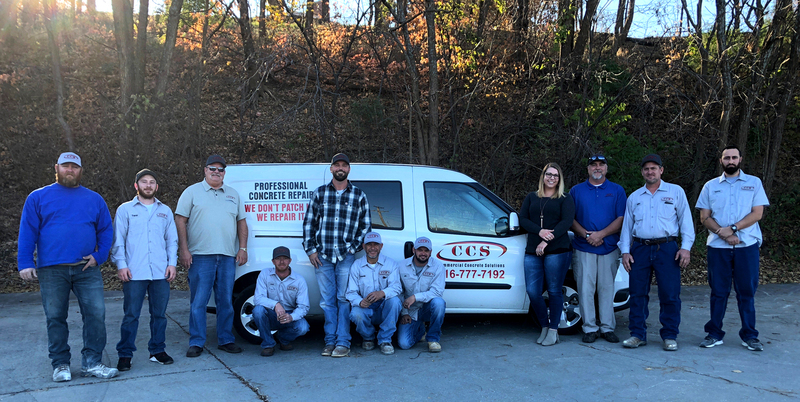 From the Bravo runway at the Kansas City International Airport to the elephant enclosure at the Kansas City Zoo, the CCS team delivers peace of mind and cost saving alternatives to concrete surface repair. Have questions about repairing concrete for your facility?